Acme Theater’s production of “Fit to Kill” runs from November 21st to December 13th Directed by Nancy Curran Willis and Jason Rutledge the thriller/comedy stars Michael Carr (Adrian), Pat Lawrence (Janice) and Becca Leighton (Amy). Get your tickets now! Photographed with Fuji X-T1, XF 55-200mm; Fuji X100S. Processed in Lightroom 5.
http://confluencevisuals.com/wp-content/uploads/fittokill-gallery.jpg 459 1018 Dave http://confluencevisuals.com/wp-content/uploads/CV-Logo-web-trans-340.png Dave2014-11-17 17:31:382014-11-17 17:31:38Acme Theater - "Fit to Kill"
From its roots as Armistice Day, the eleventh our of the eleventh day of the eleventh month in Maynard, like towns all over the United States, honor those who answered the call for their country and put their lives on the line. As many of of speeches noted, “heroes do walk among us” from World War II, the Korean War, Vietnam, and the wars in the Middle East. 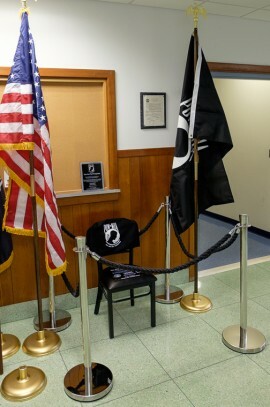 This year’s observance was especially touching as it included the dedication of the “MIA/POW Chair” which serves as a reminder that we will not forget the tens of thousands of service men and women who have never returned. The movement to have these chairs dedicated has been spearheaded by Rolling Thunder, whose president spoke at our dedication. Maynard’s chair now holds a place of honor in the foyer of Town Hall. A second chair will travel to events such as our Memorial Day observance.